During its MWC presentation this year Samsung put a huge emphasis on the exquisite display unit in its latest Galaxy S6 flagship. And, as it turns out, this is more than just a promotional stunt, the new Galaxy has a gorgeous QHD Super AMOLED panel, which might just turn out to be the industry's best. But there is also another contender - the Galaxy Note 4. Both phones were sent to DisplayMate for testing and they are having a hard time crowning a definitive winner among the two. Both the Galaxy S6 and S6 edge made it to the company's testing grounds and were put through rigorous tests. Although the phones differ in form factor, their display units are identical - 5.1-inch panel, with a QHD resolution of 2560 x 1440 pixels and a ppi rating of 577. The only difference is the slight curve in one of the models, so both were tested just in case. 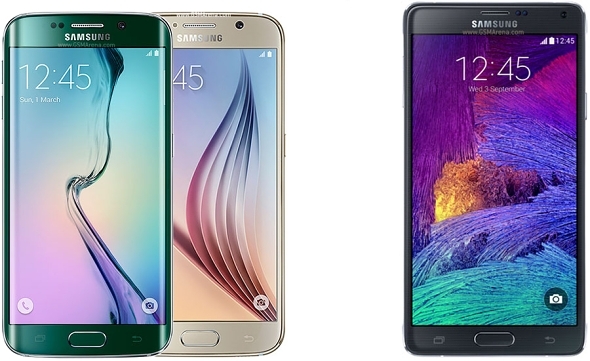 The Galaxy S6 and Galaxy Note 4 are neck-and-neck record holders for display performance, effectively tied or alternating between first and second place in almost all categories except screen size for the much larger Galaxy Note 4, and the much higher pixels per inch for the Galaxy S6. What is especially impressive is that the overall display specs and performance of the Galaxy S6 have been maintained or improved after being scaled down by 20 percent in area from Galaxy Note 4. So… The Galaxy S6 matches the Galaxy Note 4 in overall display excellence and record performance and joins it as the Best Performing Smartphone Display that we have ever tested. As it turns out, Samsung has a lot to boast about its current device lineup. Naturally, the best in class title wouldn’t be complete without a shootout with the iPhone 6 and 6 Plus, which currently hold the title "Best Mobile LCD Displays" and according to DisplayMate, Samsung leaves both of them in the dust as well. We recently evaluated and rated the iPhone 6 and 6 Plus as the current Best Mobile LCD Displays, while the Galaxy S6 and Galaxy Note 4 are the current Best Mobile OLED Displays. All are impressive and excellent displays with great state-of-the-art display technology. However, OLED displays have been advancing at a relentless and fast pace with a constant series of systematic and strategic improvements, while LCDs have been coasting on their laurels for years. So although OLEDs started from behind in 2010 they have now pulled ahead on performance and innovation based on the Lab test and measurement results reported here. To get back in the game and become more competitive, LCDs will need to adopt Quantum Dots and Dynamic Color Management. The Galaxy S6 has more than double the resolution and more than 4 times the number of pixels as the iPhone 6. It also has significantly higher peak Brightness, significantly higher Contrast Ratio in both low and high Ambient Light, significantly higher Absolute Color Accuracy, significantly better Viewing Angel performance, and has 4 selectable screen modes instead of a single fixed one on the iPhones. The incredibly thorough and detailed test documentation, results and final verdicts can be found at the source link, along with quite comprehensive comparison tables. So you can really dig deep into the question. But one thing is for sure, Mr. JK Shin was definitely not lying when he said that the Galaxy S6 and S6 edge are "the most advanced smartphones in the world". At least for now, that is. Meanwhile when while browsing the Note 4 matches and beats most other devices. Even those of 5 1080p variety. On top of having much better efficiency for everything else.